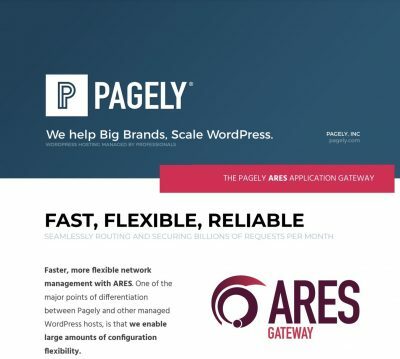 We spent most of 2017 developing a new web application gateway to better serve the tens of billions of requests to Pagely hosted WordPress sites. There’s been a lot of talk on our blog about new features and releases for 2018 so here we’d like to share a few details about how it works, the value it provides to our customers, and why we are so excited about it. Great you say, but what is that? Essentially a web application gateway is a middleman between the wider Internet and the specific systems that serve up the application or website. In our case, ARES (Air-eez) takes incoming requests for a WordPress website that we host, filters and routes those requests to the proper machines, and then passes the response (with additional filtering) back to the browser that made the request. Application gateways provide high-level secure network system communication. For example, when a client requests access to server resources such as files, Web pages and databases, the client first connects with the proxy server (gateway), which then establishes a connection with the main server. This connection is hidden to the client and protects the systems behind the proxy server. We maintain fleets of servers spread all over the world. Yet we only want to expose a handful of ‘entry points’ to this global network. ARES accepts all incoming requests at the network edge and routes those requests to the proper server in the proper Geo-location. ARES also handles requests to our image optimizing service PressTHUMB to dynamically serve the optimal image size for each client connection. Speed is the name of the game. Most times a client can be served a cached copy of the document directly from an ARES node, saving time and resources to generate that page fresh. A robust caching algorithm inside of ARES intelligently decides which assets to cache based on standard rules and custom rule sets defined by the customer. ARES sees every request to our network and employs a detailed application FireWall ruleset, as well as rate limiting, IP scanning, and custom rules to drop/deny nefarious requests before they enter the network. ARES is constantly learning what a good request looks like to further improve our defensive posture over time. Security, as you know, is a big one for us. If you are standing still, you are falling behind. ARES has a powerful remote configuration system that allows us to push changes within a few seconds. This feature enables customer specific rule sets, SSL certs, and security logic to be rolled out quickly and seamlessly. Cool, but what’s in for me? Ah, so glad you asked. The benefits ARES enables for our customers are multi-faceted. These include faster speeds, greater control and flexibility, and more robust security posture. ARES is our next move in further becoming the best solution for enterprise WordPress hosting. Easy SSL. First and foremost it enables our number one most customer requested feature: Self Serve SSL w/ Let’s Encrypt Support. Customers are now able to easily manage SSL certs for any site they host with us. In some cases a 3rd party commercial certificate is not necessary so we’ve made self-renewing Let’s Encrypt certificates simple to enable. Faster Page Loads. In our internal benchmark testing we have seen improvements of up to 80% in TTFB (Time to First Byte) times and as much as 140% in full page rendering times. Even More Intelligent Caching. Some of our hosting peers ‘cache all the things’ regardless of merit in an attempt to force their customer sites to load faster. So often we have seen sites that leverage this ‘dumb caching’ approach to the detriment of the user experience or business goals of the website. ARES enables us to do fine level granular caching of assets on a per page, per user, per cookie, per just about anything as needed to maximize performance AND customer business goals. Improved Security. The new WAF Engine inside of ARES works closely with the sophisticated Rate Limiting, Access Control System, and Request Analysis Framework built into ARES to protect your site from nefarious attacks from bad actors and unwanted bot traffic. Below you can read further about the many features in the new ARES gateway, some of which will help our customers meet their goals and business objectives as we expose the configuration controls inside the hosting dashboard allowing customers to tune their site to specific traffic profiles or user cases. Additionally many aspects of ARES are working quietly behind the scenes to deliver value across our entire customer base. Want to talk to someone on our team about ARES and how this is relevant to you? Please reach out. We love to talk about our new products.